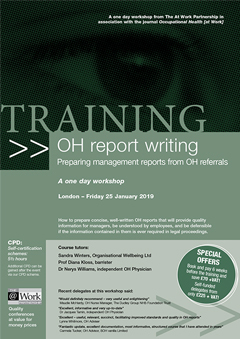 How to prepare concise, well-written OH reports that will provide quality information for managers, be understood by employees, and be defensible if the information contained in them is ever required in legal proceedings. What if the employee disagrees? This interactive session is designed to bring together all the skills that you have learnt during the day, so that you can see how they can be applied in your own practice. Book and pay by 7 January 2019 and save £80 +VAT!